Cranberry treats don't just have to be for Christmas do they? Let me tell you, I have some friends and coworkers who have been convinced otherwise! I have become the birthday baker at work. I do not mind, because I find creating in the kitchen to be therapeutic and energizing. I am definantly one that could be accused of loving through food. I made these bars at Christmas for the first time this last year. It is a bit different from the recipe I found this past fall, as I tend to make them my own somehow. So, I made them again for a meeting in January, and this past week for a co worker's birthday. They were yet again... a hit! In a microwave, melt butter; stir in brown sugar. Transfer to a large bowl; cool to room temperature. Beat in the eggs and vanilla. Combine the flour, baking powder, salt and cinnamon; gradually add to butter mixture. Stir in cranberries and chopped chocolate (batter will be thick). Spread into a greased 13-in. x 9-in. baking dish. Bake at 350° for 35-40 minutes or until a toothpick inserted near the center comes out clean (do not over bake). Cool completely on a wire rack. For frosting, in a large bowl, beat the cream cheese, confectioners' sugar and orange peel if desired until blended and fluffy. Frost the bars. Sprinkle with cranberries and white chocolate chips. Cut into bars. Store in the refrigerator. Yield: 2-1/2 dozen. These are very tasty, and great for many "girly" occasions such as baby showers, wedding showers, Girl's nights out/in, wedding receptions, etc. 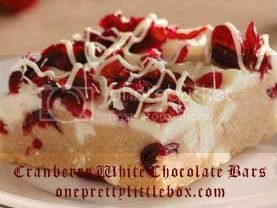 These are very similar to Starbucks' Cranberry bliss bar's that are seasonal from Thanksgiving through Christmas. :) Now you can enjoy them anytime you want. Oh, they look TOO GOOD! Yum!! Come bring this to A Themed Baker's Sunday over at Cupcake Apothecary where the theme this week is BERRIES!